Benjamin Orames was born on March 15, 1876 in Kyneton, Victoria, Australia. A second generation Australian, Orames was of a cheery disposition, growing up with good health and abundant energy. Taking his first job before he was fourteen, Benjamin Orames was at times an auctioneer's clerk, a carrier, a baker, and he learned to play a brass instrument. At age nineteen, discontented with his surroundings, his work and his wages, he went to the gold fields of West Australia. There was enchantment in the prospects of finding gold but young Orames soon found that gold was not laying around, to be picked up under every bit of mulga scrub or from beneath the proverbial bush. As what little money he possessed slipped through his fingers for food and shelter, Benjamin Orames arrived at a crossroad. He must determine what to do with his life; ride with the current (so to speak), gambling and drinking and otherwise spend his time in a pursuit of life evidenced by all those around him, or seek an alternative more in keeping with his character and purpose. In this critical time, turning down work that seemed to provide substance but which contained the influences he sought to avoid took courage. At last he happened upon a first-rate opening. An overhead job on a gold mine became available, a position where his resourcefulness and close application to duty won for him advancement and trust beyond any expectation. It was during this time that Orames 'returned' to the Salvation Army (for this is where he leaned to play music in his youth). Not wanting to affiliate himself with the Army until he had 'regular work', but making it a personal commitment to avoid those activities contra to his sense of right and appropriate behavior, Benjamin Orames was enjoying a prosperous life consistent with his beliefs when an accident happened. 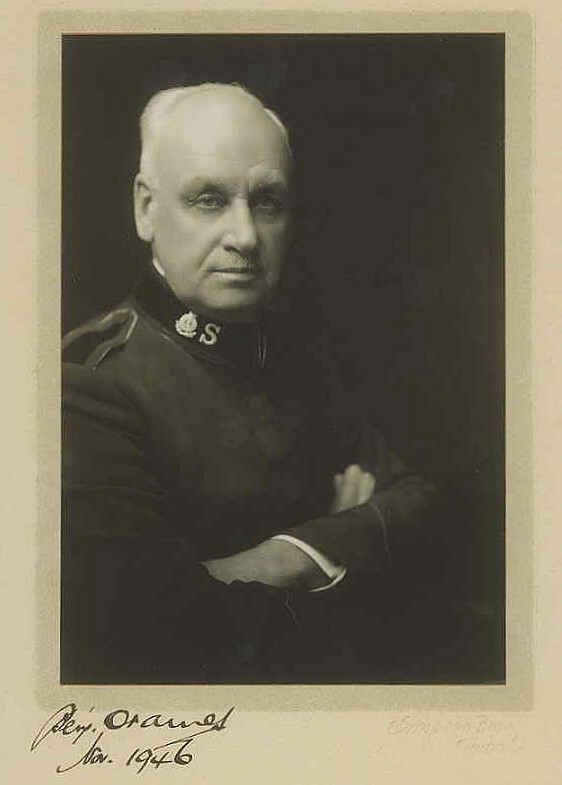 Bed-ridden for weeks, in the midst of his suffering God revealed to Orames' reluctant heart his future path of duty - that of becoming a Salvation Army officer. He let the Spirit lead him, and entered the School for Officers Training in Melbourne. Such an auspicious career contains many more details than can be revealed here. Please visit the reference above for additional insight into the life and times of Commissioner Benjamin Orames who, consistent with Salvation Army terminology, was promoted one last time, Promoted to Glory, on June 5th, 1954.